Call for Additional Discount on New Frame Orders! Click on an Accessory Below to view more information. Roller bearing seat depth that allows for smoother seat depth adjustment. Cannot be ordered off-unit. Removable actuator handle adjusts the distance of reach to meet user’s needs. Not available with Pow’r Up Lift. Attaches to the actuator handle for users with limited dexterity. Adjusts for various hand sizes. Not available with Pow’r Up Lift. Attaches to the actuator handle for users with limited range of motion. Makes the first few pumps easier and descending more accessible. Adds additional 7” (18 cm) in each direction. Not available with Pow’r Up Lift. Velcro® and D-ring adjustment hold feet in alignment with two attachment slots for proper foot positioning. Straps fit foot height 4”-6.5” (10-17cm). Velcro® and D-ring adjustment hold feet securely in place at ankle and toes. Straps fit foot height of 4”- 6.5” (10-17cm). 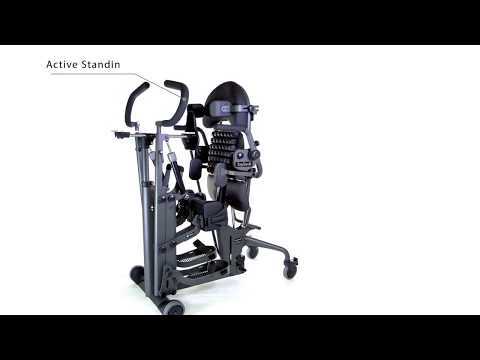 Helps therapists monitor standing progress. Attaches under seat magnetically. Supports the hips in symmetrical alignment from sitting to standing. When used on a Medium the width range is 11”-17” (28-43cm), when used on a large the width range is 12”-17” (30-43cm). Pad size is 4”x6” (10x16cm). Provides anterior support to trunk without a tray. Top of back is 13” (33cm) from seat. Top of back is 19” (48cm) from seat. Top of back is 13” (33cm) from seat. Removable back releases with two knobs and provides rear access for patient lift transfers. Top of back is 19” (48cm) from seat. Removable back releases with two knobs and provides rear access for patient lift transfers. Top of back is 13” (33cm) from seat. Removable back detaches with two knobs and provides rear access for patient lift transfers. Top of back is 19” (48cm) from seat. Removable back detaches with two knobs and provides rear access for patient lift transfers. 2” (5cm) wide positioning belt provides hip stability with the security of an airline style buckle. Fits hip circumference of 26”-55” (66-140cm). Back required. Velcro® and D-ring adjustment. Chest strap pad is 5”Wx19”L (13x48cm). Fits users with chest measurement ranging from 30”-46” (76-117cm). Back required. Velcro® and D-ring adjustment. Chest strap pad is 5”Wx19”L (13x48cm). Fits users with chest measurement ranging from 34”-54” (86-137cm). Back required. Provides quick adjustment of the back angle for multiuser environments. Replaces standard 5 point knob. Back required. Neoprene®. Size is 11”Lx 9.5”W (28x24cm). Back and accessories mounting bracket required. Not available with cane back. Neoprene®. Size is 12.5”Lx10”W (32x26cm). Back and accessories mounting bracket required. Not available with cane back. Neoprene®. Size is 17.5L X 11.5W (44x29cm). Back and accessories mounting bracket required. Not available with cane back. Neoprene®. Size is 20.5”Lx12.5”W (52x32cm). Back and accessories mounting bracket required. Not available with cane back. Moves mounting points for chest vest higher to secure shoulders in position. Chest vest not included. Back and accessories mounting bracket required. Not available with cane back. Multiple adjustments, removable for transferring. Depth range is 3” (8cm). Height range is 4” (10cm). Pad size is 4”x6” (10x15cm). Back and accessories mounting bracket required. Not available with cane back. Multiple adjustments, removable for transferring. Depth range is 3” (8cm). Height range is 4” (10cm). Pad size is 4”x 6” (10x15cm). Back and accessories mounting bracket required. Not available with cane back. Height range from seat using 13” back is 21”-30” (53-76cm). Back and accessories mounting bracket required. Not available with cane back. Height range from seat using 13” back is 25”-34” (64-86cm). Back and accessories mounting bracket required. Not available with cane back. 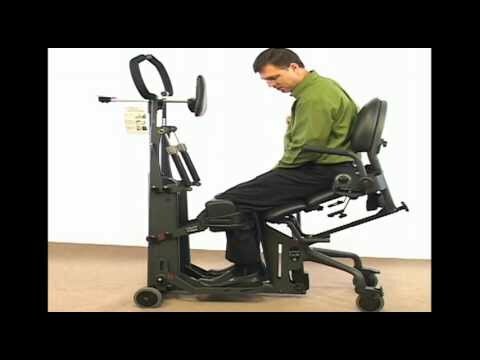 Makes pushing the stander easier for the caregiver. Back and accessories mounting bracket required. Not available with cane back. 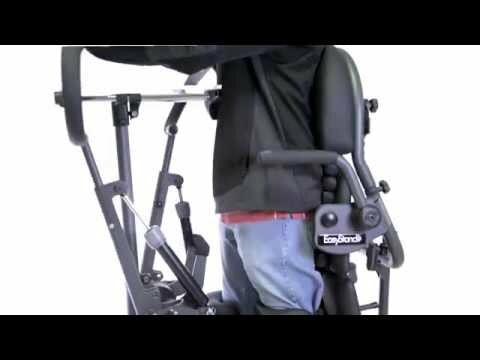 The EasyStand Glider product provides the user with state-of-the-art Active Standing technology that can be found in no other standing frame. The Glider stander is available in both Youth and Adult sizes (sorry, the Glider stander is not available with the Evolv XT model). The Glider product features a wide concave seat and flip-up kneepads that make transfers easier. A positioning bar provides a sturdy grip during the transfer. If needed, a patient lift can also be used to transfer a person into the Glider product. EasyStand Glider Large fits individuals from 5'0"-6'2" and up to 280 lbs. RSW Stores is an authorized dealer of Easy Stand Products; however, they are not otherwise affiliated with Easy Stand If you are a dealer and need to contact Easy Stand please call 800-342-8968.